I’ve been using the app for about a year and it has never issued a bad instruction. It’s multiple route to choose from and the traffic features are a real winners. The problem comes when you try to reach someone at the developer for tech support. They are slow to respond, don’t answer your question and leave you high and dry. My subscription is still with in the one year I paid for, but the app is back to basic mode and asking me to pay again. A simply fix for them, your thinks, but no. It’s been 3 days and now the weekend is here and I have no option but to repurchase something for which I’ve already paid. 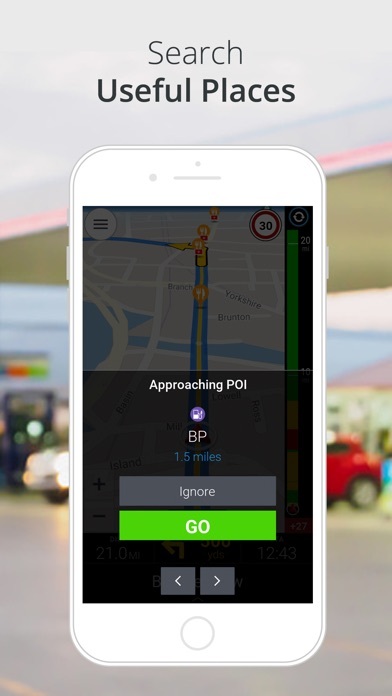 I rely on this app to assist me in safely and reliably doing my job and have communicated that to them, but have been ignored. So buy this app with the knowledge that you may be on your own. I downloaded his app because it said it’s also for RV NAVIGATION...but it’s not an option! This was my go to app for navigating with or without cell service. I was going to purchase the European add on for an upcoming trip and updated the app. Not offline mapping requires a subscription. Boo to the greedy developers!!!!! Seems to be loaded and working. I have wanted an app like this for a long time. My job requires me to drive around at 14’8”. I gave this app a try, and I will not be purchasing the full version. However, if they would like my input I would continue to work with the developers for free. 1. I almost hit around 6 or 7 low bridges throughout the iron range of upper Minnesota, Wisconsin, and Michigan. The app did not have them marked. Thank god the state did, clearly a 14’2” bridge. Which litters all of us hwy 2 and us hwy 41. I would be as bold to say that most the bridges in the UP are 14’6” or lower at least. I was so busy I didn’t get a chance to flag them all. They should look into it. 2. The locations of where I was going were off by at least ten miles. I had to use google maps to get there. 3. Speed limits are off. It beeped at me for 30 miles of 55mph. The app has it as a 45mph. This was before I learned about the accucheck however so I didn’t get a chance to flag it. The one good thing is: so far I believe it’s truck routes to be accurate at least. I was never on a weight restricted road. After all is said is done, I would be open to helping the developers improve the app for free, but at this point there is no way I would pay money for an app that is basically a less accurate version of google maps. Please improve low bridge feature for sure. Anything under 16’. Apple Maps works... Google Maps works... But, a paid Map App can’t figure it out. 1 Star for a 14 Day trial. Time enough to delete. We recently visited Iceland and knew that we were going to disable our data plans for the week. Copilot provided us with a great alternative to purchasing a GPS unit. We downloaded the Nordic maps for free and the app gave us 14 days free turn by turn directions. No complaints, worked very well. Used this for years - no problems. After update, the app is very difficult to use. It is very slow. NEARLY IMPOSSIBLE TO SEARCH FOR PLACES NEAR A DESTINATION. Three steps backwards from the previous version. I wish I never upgraded. I also upgraded to to paid version on one iPad. Unlike other apps, it tells me I need the paid version on the second iPad when I want to save a trip. At this point I think -1 star would be generous.c Now I see RV profile has been removed. Man are they getting greedy. I originally bought this for RV use. I am not giving them any more money. Between two gps's and a map I will find my way. Update: Now to get RV navigation I have to pay a yearly subscription. I definitely feel ripped off. I originally purchase this for RV. Now I have to pay yearly? Fat chance! I wish I could give this a -5 stars. I don't subscribe to software. I buy it outright or forget it. March. Still cannot find places en route. When I first downloaded app and purchased upgrade and map of North America I was very pleased. 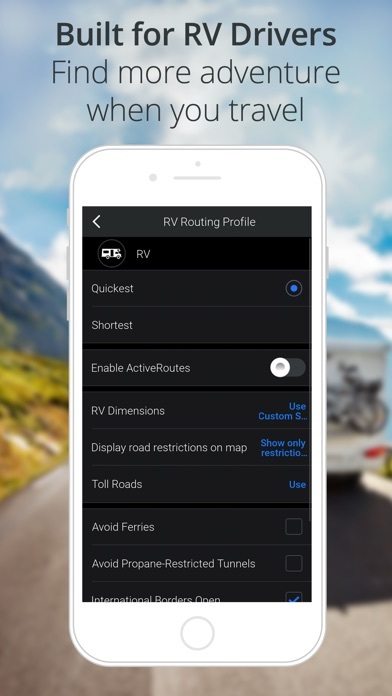 Went to use recently and noticed my RV profile was gone and could only choose auto profile. Not what I originally bought app for. I was told I had to buy another upgrade again for my RV. Rip off. Why can’t I zoom out! I need to see if there is any parking at the spot I’m going to. And why is there no satellite view. This app could be great if it had these abilities. I need to know if bridges are low for my RV. I think I’m going to cancel this app. Way to hard to figure out! I need a beer now! Used to be solid, but every since the new update the routing has been erratic as hell. Try going across i94-i90 north dakota-montana. It tells you to get off on every exit, or take some random state highway that would double your travel time. But it suggests bad routes, with highly inaccurate estimated times for everywhere I have gone lately. Basically unusable for longer routing. Only use for last few miles of arrival now. The only thing that keeps me from using this app is the lousy search feature. Every other app lets you easily find a destination by simply entering the business name, city and. St. Not this one. Ridiculous! You would have thought this would have been a top priority for the new version. 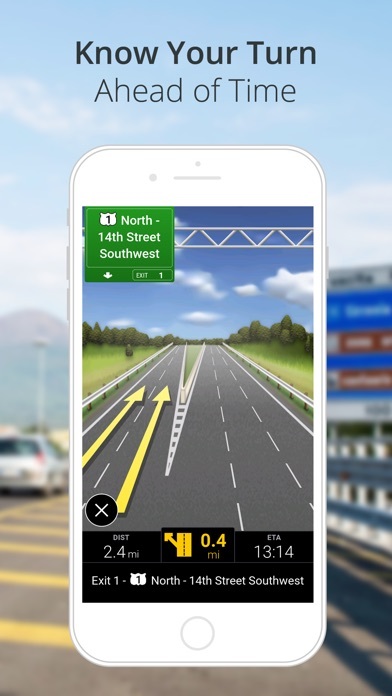 CoPilot, go look at Waze or Google Maps for the correct way to implement search! Copilot team, it would be nice if you make one price to purchase it 30, 40, 50$ etc. you can even sell map upgrades but charging monthly or yearly is a ripoff business. The maps are OFFLINE, so, unlike Apple or Google, the navigation does NOT need an online connection! 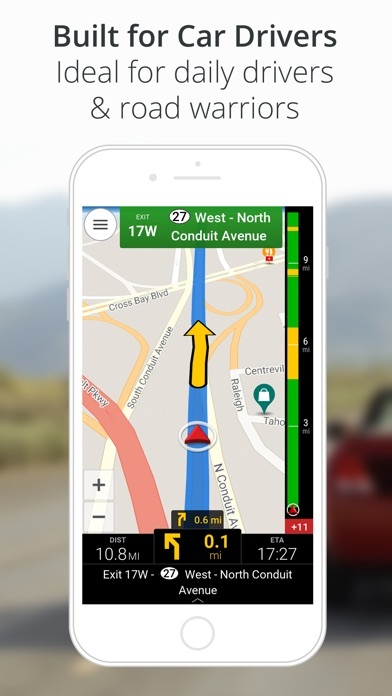 This feature allows copilot to navigate even under severe weather conditions. Best GPS--ever! It’s a decent app, and I am still learning the ends outs. I use it with a RV, and have noticed a lot of inaccurate information on a 6hr one way trip. Mostly in regards to roads that are not updated within the map, and exits not where they are supposed to be. I would also love to see CarPlay integration, which would help on solo trips, so I am not fumbling with my phone or iPad. This WAS a free app that worked wonderfully for me until the developers decided to take every feature that was free and require a subscription for it!!! Now the app is useless as a FREE app...unless you just want a map to look at. 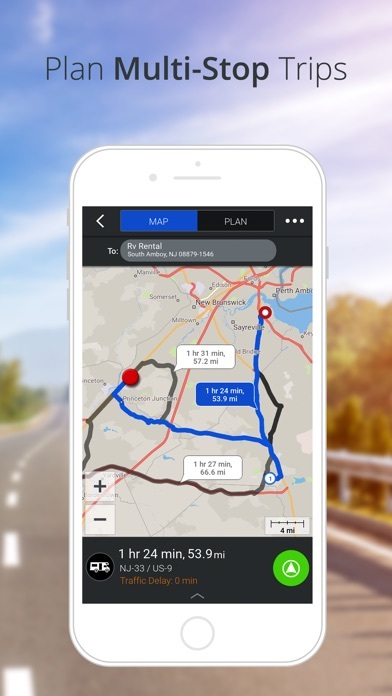 The free basic plan will show you your current gps location and show you a road atlas that it. You can’t even get BASIC point to point navigation or route planning anymore!! F”#sd thieves! I have been using this all for many years, locally, in rental cars (big $$ saver). Best app purchase I’ve ever made hands down. I even use this over my installed navigation system, it’s more accurate. 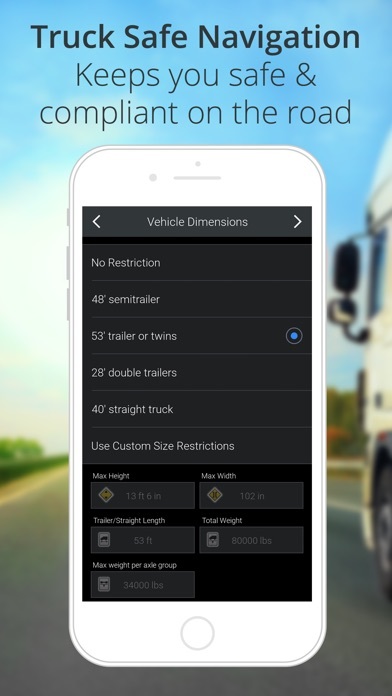 I have noticed that since the truck version was integrated to this version that when choosing a route that isn’t the first one copilot initially suggests the app has a tendency to automatically swap back? In this industry we do not have room for error whatsoever. NONE.. have you ever tried driving one of these trucks? Ever had to turn around after missing a turn? it’s kind of a pain. Also the app STILL tells me to stay on the interstate almost every time there is an exit that goes on a U.S. highway!! FIX THIS PROBLEM FOR THE LOVE OF GOD! If it’s not a problem then at least give the user the option to cut that crap off without having to mute the voice navigation entirely! When I listen to my radio show I don’t want it interrupting every 10 minutes for that when I need to stay on that interstate for hundreds of miles. I constantly update my reviews so there is no getting away from me on these issues. Once fixed I will update to reflect this to the potential users of your app. The Ap appears to be free. After taking a full 24 hours to download, and using all of my WiFi data, it opens with the option to continue with your 14 day free trial or buy the Ap! I didn’t even look at the price, just immediately deleted. This app is missing lots of data. The aa few roads with speed limits and what they have is out of date. I can’t find many addresses and what they do find is off by hundreds of feet. Needs lots of work, better data, more recent data, better accuracy... and more. Maybe a few revisions from now it will be ok to use. Not ready for primary use at this point. OMG, how freaking long does it take to download a map? Trying to download Eastern US and it has been 24 hours and only 51% complete. Sitting on my home Wi-Fi and downloading is terrible. Ridiculous how slow the download is. Not worth the wait. I don’t like apps that won’t f######g do anything until you spend time giving away your personal information. I like to take them out for a spin first. This app insists on making me sign in. DELETED. The ONE thing that I like about this app is that I can still use it when I’m offline and/or out of cell range, but that’s the ONLY thing I like about it. It will rarely find businesses nearby when I search for one. I cannot figure out how to display an address from my favorites. Once it’s in there, I can’t find a way to see it again! Editing doesn’t even show it and when I arrive at a destination, I sometimes need to see the address to know which building! 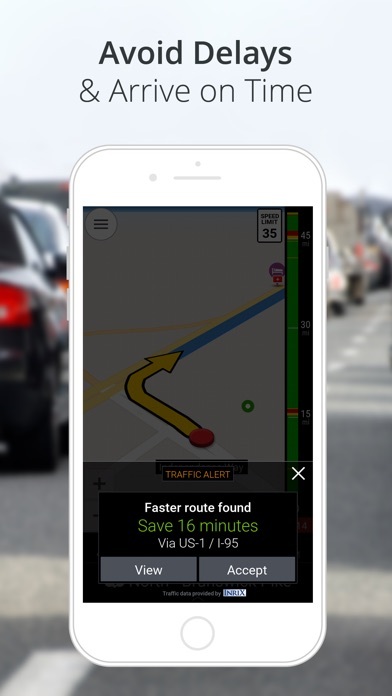 It’s really hard to find features I need (if they even exist on this app) such as finding an alternate route to get around a road closure, and I haven’t figured out how to show a route starting from any location other than where I am at the moment. It’s an incredibly frustrating app to use! Flawless directions. Very accurate on eta and notifications. Maps are downloaded so you don't need wifi or burn up your data. If you drive or hike a lot get this app. It's way better than rand or all the other apps and brands I have used. I’ve been using ALK for years, even when I had to use it on a laptop before the phones. Pc miler. Since I can’t find the answer in the app or a place to ask support in the app I’m asking here. 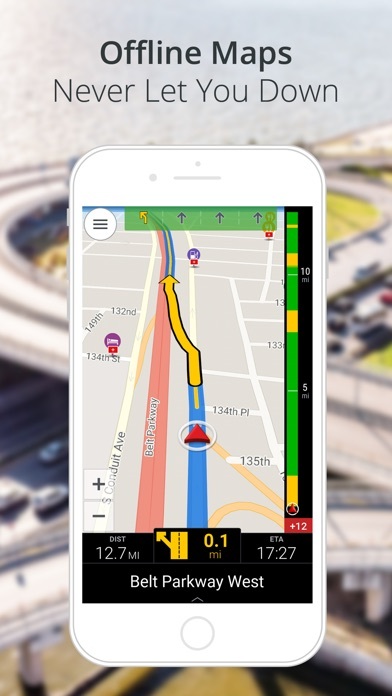 I paid over 150.00 $ for the truck app and every year for traffic. That three hundred + bucks was for life. Are you gonna honor that or are you expecting us to pay again monthly or yearly? 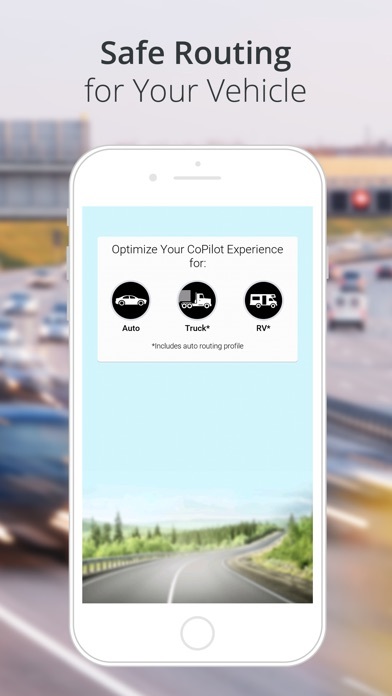 I have used and bragged about copilot to my friends for years. However, this recent up grade is terrible. Not only was I forced to upgrade just when I needed to use the app off line, the conversion was complex and I had to re-enter all of my favorites individually as they would not transfer over. Then, and only then, did to learn that the find feature to access my favorites and other items is now a “premium”. Such a basic function now with the premium cost. Ugggg. Now, just went to upgrade, so I could use the search feature. Only upgrade includes online access. The best feature of copilot was being able to navigate off-line. If I wanted to be online and burning through data why use this when Google maps and other online services are available. I think I’m done with copilot. Very sad. Time will tell how good it is once I start touring the country on the bike this summer. But I’m impressed so far. It is certainly better than those from some of the big name companies. If you like good customer service buy a store bought gps. This company is joke and doesn’t care after you’ve given them your business. I've only had small annoyances with the app; tech support was slow and we're not able to resolve either issue. The first issue was my location marker was the size of dime. I did a from scratch rebuild on the iPad and that resolved it. The second issue was current, active traffic has not worked for around a year. They were not able to resolve that issue either. Today I installed the new app,, transferred the settings and I had 12 days left on active traffic. I paid the $9.99 for another year to save the trouble of getting them to take action. At first.the app was buggy as heck but it's pretty good now. Outside of slow and In infective tech support I like the app. However, I am currently not purchase the trucking add on.... So I guess I'll go without it. I use google maps for active traffic and backup routing. I guess I could just use google but there are features I don't want to go with out. I've been using the app for several years. I rarely use interstate highways on my RV. It is extremely difficult to exclude in this app. I can select avoid, but only for a few miles. I am planning a route of which Imam very familiar as a test route. Most everything is great, including offline maps. Would like elevation profile though. Just too much trouble to exclude I75 from ATL to Orlando for example. I want to use 441 most of the way. WHY cannot I set a road as preferred!